Comments: Vuggy matrix covered with yellow micro crystals of mendozavilite. Location: Rustler mine, Tooele County, Utah, USA. Scale: Specimen size 1 cm. Comments: Light yellow micro crystals of mendozavilite and earthy alterations in vuggy quartz matrix with black schorl. Location: Rustler mine, Tooele Co., Utah, USA. Scale: Picture size 1 cm. Comments: White chalky massive mendozite. Location: Gold Bottom Mine, Inyo County, California, USA. Scale: See Photo. Comments: Black, acicular crystals of meneghinite on matrix. Location: Bottino Mine, Tuscany, Italy. Scale: 1x1 cm. Comments: Orange rhombododecahedral crystals of menezesite to 0.75mm on matrix. Location: Jacupiranga mine, Cajati county, Sao Paulo, Brazil. Scale: Picture size 1 cm. Comments: Brownish-red rhombododecahedral crystals of menezesite over calcite (with tiny black tochilinite inclusions). AmMin v93:82. Location: Jacupiranga mine, in Cajati county, São Paulo state, Brazil. Scale: Crystal size 0.5 mm. Comments: BSE image showing menshikovite (mnv), paolovite (plv), isomertieite (ism), cobaltite (cob), and chalcopyrite (ccp) with quartz (qtz) and a Fe-rich aluminosilicate (sil). Location: Lower (exo)-contact of the Chiney intrusion in Siberia. (CanMin, v40:679). Scale: See Image. Comments: Pale blue to white powdery aggregate of mercallite. Comments: Silvery metallic mercury coatings on quartz. Location: Socrates Mine, Sonoma County, California, USA. Scale: See Photo. Comments: Small silvery droplets of mercury on tan-colored rock matrix. Location: Sonoma Co., California, USA. Scale: Picture size 5 cm. Comments: Yellowish crystals of mereheadite to 1mm embedded in matrix. Location: Merehead quarry, Shepton Mallet, Somerset, England. Scale: Picture size 5 mm. Comments: Borovskite (Bvk) - temagamite (Tmg) - merenskyite (Mrk) composite grain included in chalcopyrite (Ccp). (CanMin, v 42, p 674). Location: McBratney high-grade PGE-Au occurrence, Bear Lake mafic unit, Proterozoic Flin Flon greenstone belt, Manitoba, Canada. Scale: See Image. Comments: Red arrow points meridianiite on the underside of a post in a frozen pond. Ice, in the form of snow covers the top of the post and the frozen pond surface (AmMin, v92:1757). This in an analoge for probable Martian occurrences. Location: The ponds are on the Basque claims, which occur in a small valley in the Thompson region of central British Columbia. Scale: See Image. Comments: Colorless transparent prismatic merlinoite microcrystals in vug. Location: Lagno Ahendo Lare, Vesuvius, Naples, Campania, Italy. Scale: See Photo. Comments: A sharp, chemically zoned crystal of copper-brown merrihueite(?) (see Lapis-Magazine 4/2002 Page 38/39) overgrown on bluish chayesite. Location: Basalt quarry, Pauliberg Mt., Kobersdorf, Oberpullendorf, Burgenland, Austria. Scale: Crystal Size 0.15 cm. Comments: BSE image of merrillite intergrown with silicates (plagioclase (plag), orthopyroxene(opx), olivine(ol)) next to coarse FeNi-metal (white). Location: Portales Valley meteorite (1988). Scale: See Image. 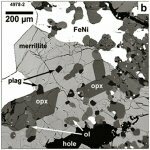 Comments: Oil immersion hotomicrograph of inclusions of mertieite-II in matrix of Pt-Fe alloy (CanMin, v 42, p 614).